Thermo Fisher Scientific has partnered with GlaxoSmithKline (GSK) and Pfizer to develop a universal next-generation sequencing (NGS) oncology test for solid tumors, which can be used as a companion diagnostic for multiple drug programs. The new test is said to be developed using Thermo Fisher’s Ion Personal Genome Machine (PGM) Dx Platform, Ion AmpliSeq technology, and content from the Oncomine Cancer Research Panel. Thermo Fisher Scientific Oncology for Life Science Solutions head Dan Rhodes said the cancer patients increasingly require multiple and complex genetic tests to realize the promise of personalized medicine in oncology. "Together with Pfizer, GSK, and potentially other pharmaceutical companies, we seek to change the paradigm and develop a single next-generation sequencing test that can provide a comprehensive analysis of multiple, relevant genetic markers," Rhodes added. After the test is developed, Thermo Fisher intends to submit it for premarket approval to the US Food and Drug Administration (FDA) and other global regulatory authorities. The markers from the Oncomine Cancer Research panel will allow in simultaneous testing of single nucleotide variants (SNVs), copy number variants (CNVs), gene fusions, and indels across 143 unique cancer genes. Multiple genes can be simultaneously analyzed from tumor samples through next generation sequencing using the Ion PGM Sequencing Platform combined with Ion AmpliSeq technology. Thermo Fisher Scientific Life Sciences Solutions president Mark Stevenson said: "This collaboration with Pfizer and GSK enables us to build upon our market leading position in NGS oncology, with hundreds of customers around the world sequencing tens of thousands of tumor samples each month using Ion Torrent technology." 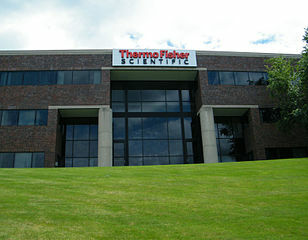 Image: Thermo Fisher Scientific headquarters in Waltham. Photo: courtesy of Coolcaesar at en.wikipedia.